13 May 2013 : Ian Fitzgibbon in conversation with Kevin Cronin. Ian Fitzgibbon, IFTA-nominated director of 'Death of a Superhero'. 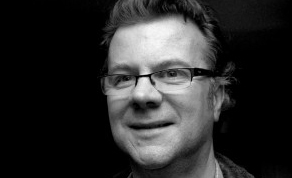 Award-winning Irish director and writer Ian Fitzgibbon - IFTA nominated this year as Best Director for ‘Death of a Superhero’ - took the time to chat to IFTN about the challenges of filmmaking, his start in the industry as an actor, and advice for budding directors hoping for their big break. Mr Fitzgibbon was previously IFTA-nominated as Best Director for ‘A Film with Me in It’ and shared IFTA nominations for Best Script with Michael McElhatton for ‘Paths to Freedom’ and its big screen successor ‘Spin the Bottle’. He also won the Special Jury prize for 'A Film with Me in It’ in the 2009 Istanbul International Film Festival and is a well-known face on TV for playing the extremely sarcastic priest father Jessup, who gets locked in Jack's underwear hamper, in 'Father Ted'. Mr Fitzgibbon, can you tell us a bit about the inspiration and background to ‘Death of a Superhero’? It was a project that came to me via Michael Garland of Grand Pictures. It had been in development hell for a couple of years. Initially the kid was going to be played by Freddie Highmore. I did a very extensive re-write with Mark Doherty who I worked with on ‘A Film with Me in It’. We spent six weeks in a room above the International Bar in town. It was intense but we got there in the end. Mark is an incredible writer. Making a film is very challenging to me. I’ve made a few now and it doesn’t get any easier. Financing is becoming more and more difficult. But the biggest challenge in the end was the animation - how to integrate it properly to make sure that it was just as much a part of the story as the live action, and not just a cool add-on. I worked with a team of animators/SFX people in Munich. It was a long painful process but fascinating. Also I got to spend six months in Munich, which was great fun. Did training/education play a role in your break in filmmaking? I trained as an actor in RADA in London. I think that’s been incredibly useful when dealing with cast. I feel very comfortable talking with them. It makes for a good working atmosphere. What was your first job in the industry and how did that lead to your current position? One of my first jobs out of drama school was a role in a film where I played Julie Andrews’ and Marcello Mastroianni’s son. It was shot in Paris. I had a great few weeks swanning around with Mr Mastroianni. He brought me to some amazing bars and restaurants, but the film sank without a trace. That was a good early lesson for a young actor. What do you enjoy most about being a director? Shooting. It’s very stressful but it’s a lot of fun. I’ve just shot a Channel 4 pilot. We had a family of eight in a tiny council house in Manchester. At one stage, there were seven characters with dialogue in one tiny bedroom. We had 45 minutes to shoot it. On a shoot, I get up at 5.30-6am and read through the scenes for that day. Then I might try and have a coffee with the DP and talk through any special shots I have in mind or tricky set-ups. On set I like to rehearse with the actors. Once I’m happy with the shape of it, the camera department can set up for the first shot. While they’re doing that, I like to refine the scene with the actors. At lunchtime I might give the editor a quick call and see if he’s got any useful feedback on what he’s watching. I don’t watch rushes but I like assemblies. What advice would you give to anyone wishing to become a director? I’m amazed by the number of young people who come up to me and tell me they want to be a director. I ask them what they’ve shot and very often the answer is nothing. I don’t understand that. Nowadays you can shoot on an iPhone, edit on a laptop and post it on YouTube. My advice is don’t do it unless you have a burning desire. I think if you really want to be a director, you should be constantly shooting, getting your mates together and just doing it. Sometimes I think people like the idea of it but not the actuality. What director’s work do you most admire? It’s more films that I admire: ‘Amour’, ‘The Lives of Others’, ‘Pan’s Labyrinth’ but I also love silly comedies like ‘The Wedding Crashers’. What is the next big project you’re planning or currently working on? At the moment I’m in post-production on ‘Raised by Wolves’, a Channel 4 pilot written by Caitlin Moran with her sister Caroline. I’ve also started prep on ‘Trying Again’ a new comedy for Sky written by Chris Addison, Simon Blackwell and Jesse Armstrong. I’m a big fan of ‘Veep’ and ‘In the Thick of it’ so I’m excited to be working with them.